My Kawasaki KZ440 just a few days after I bought her, before she became The Little Rat. When I started shopping for my first motorcycle, I knew exactly what I wanted: a manageably-sized, unique vintage bike that struck the perfect balance between vintage patina and reliability. It was love at first sight when I found my now-rebuilt KZ440 on Craigslist. But now, three years and two bikes later, I’ve realized that I chose this bike for all the wrong reasons. Like many new riders, I was too concerned with how the bike looked. I didn’t even consider there might be more I was missing. Don’t get me wrong: I am in love with the work GT-Moto did to bring The Little Rat to life. But my story could have had a very different ending. If I hadn’t met Sofi, I could have ended up selling my KZ for far less than I paid for it. Or worse: the bike was in such bad mechanical condition, Sofi didn’t trust it enough to do a pre-rebuild test ride. The thing is, there’s nothing special about my story. I’m not the first new rider to have fallen into this trap, and I know I won’t be the last. I’m not going to try to talk you out of that cafe’d-out Craigslist CB550, but as someone who has been in your shoes, here’s what I wish someone had told me. 1) The coolest thing about owning a motorcycle is riding it. The first thing to understand about motorcycles is that how your bike looks has nothing do to with how much fun you’ll have riding it. Yes, some bikes look cooler than others. But even the most dorky-looking “dad bike” out there has given at least one person an ear-to-ear grin. If you’re worried about looking cool, or getting a bike that looks a certain way… well, you can check that right at the door. The way your bike looks will be the last thing on your mind the first time you hit 60 MPH on an open freeway. Whatever bike you do end up with, if it’s a good fit, you’ll likely end up appreciating it anyway: I never much cared for the looks of a modern naked bike, but the more I ride my new FZ-07, the prettier she looks. 2) Working on motorcycles is a not the same hobby as riding motorcycles. One reason I wanted to get a vintage bike was that I wanted to learn to work on it. And I’m glad I did: working on vintage bikes has become one of my favorite, most fulfilling hobbies. But I’ve since learned that working on vintage bikes is not the same as learning to ride. Of course, I believe everyone who rides should have some basic mechanical knowledge. Knowing how to check your fuses or change a tire can come in handy on the side of the road. But, while you’re learning to ride, you need a motorcycle that does what it’s supposed to do. It can take months to become a competent rider, and you have more important things to think about than worrying about your battery scraping your tire, first gear not working, or your bike idling out at every stop (true story). 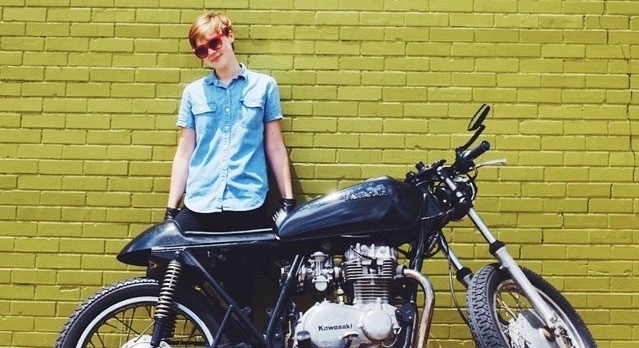 There’s nothing wrong with getting a vintage motorcycle as your first bike. Just make sure you do your homework, find a reliable mechanic, and prepare yourself for the challenges. When I was shopping for my FZ last year, my dad gave me some good advice. I was telling him that I wanted a bike that I could take on longer trips, that could do some off-roading, that would be a good around-town bike and (of course) fit my size. He told me that, in his experience, when a bike can do everything, it usually doesn’t do any of it very well. Thompson wrote that in 1967, but it’s still true today. So, when you’re shopping for a new bike, the goal isn’t to find the perfect motorcycle, period. The goal is to find the perfect motorcycle for you right now. Be honest with yourself about what kind of bike you’ll need for your first few months of riding. Don’t worry about everything else you’ll want to do just yet — there will be time for that later. 4) Choose a bike that supports your learning. As you’re making a list of everything you want in your first bike, remember: the only thing that really matters is that the bike supports your learning. What does that mean? Well, it means something different to everyone. The general idea, though, is that your bike should fit your current skill and riding style, but also give you room to challenge yourself and grow. To be fair, most people do think about getting a bike that fits their current skills. Even I knew that I needed a shorter, lightweight motorcycle as my first. But what most people don’t think about is giving themselves room to grow. For example, Joanne Donn of Gearchic is 5’2″ and rides liter bikes, and her best advice for short riders who want to learn to ride taller bikes is to start out on a tall, but lightweight bike. Think about the kind of riding you want to do, and the things you want to learn, then choose a bike that will get you going in the right direction. 5) You will own other motorcycles. Shopping for your first bike can feel like a monumental, irreversible decision. After all, you only get one first motorcycle. But here’s a secret: there is almost no chance that your first motorcycle will be your last… so why stress about it? If you get a bike that’s “not your style” but does its job well, what’s the worst that could happen? You sell it a year from now, and get the bike you felt were always meant to ride. You’ll still have a solid foundation of skills that will keep you on the road for years to come. If you choose a bike that supports your riding now, one that’s easy and fun and allows you to challenge yourself and grow as a rider… one day the time will be right for the 1200cc Sportster or the 1975 CB550. Or, just maybe, you’ll fall in love with something you never expected to. I know I did. It has taken me five years to get in sync with my Shadow and really have the confidence to enjoy it. Starting out too big is probably the reason, but I was convinced a 750 was manageable. It can be a hard thing to learn until you’ve experienced it! Glad you’ve hit your stride now though, I bet that feels awesome 🙂 Thanks for reading, Diane! “When a bike can do everything, it usually doesn’t do any of it very well.” Holy words. First bike was a Honda CBR 600 F2 – First thing somebody told me is, that “it’s a great bike to learn on” (it is); and that I would “outgrow it” (I did – just before I lost it – more on that later). Still one of the best decisions I ever made. Your dad is RAD (must be one of the reasons you’re so cool 😉)! This whole blog, as usual spoke to me, LT; but #3 really struck home. As you know, I used to own an HD Night Rod (a bike I had my eyes on for years), which is theoretically a hybridization of a sport-bike and cruiser. Riders from either genus would disagree; and they would be right. The Night Rod was a very fun ride; but, like your Rad Dad says, most hybrids fail to perform their disparate functions as well as the source templates. The Night Rod, though a VERY fun ride, was not the exception. Something else to consider, which I might have missed in the blog: Just sitting on the bike can make a world of difference. I used to think the HD V-Rod Muscle was one of the prettiest bikes around until I sat on one. That relationship ended with alacrity once I did. Also, if you can find a dealer (or a REALLY good friend) who will let you take multiple test rides, that can also help narrow the field. Lastly, for all the first-timers, I would respectfully recommend they shoot copious pictures of their first bike; and get someone to shoot an equal number of them riding it. You’ll most assuredly get another bike, and you’re just as sure to miss your first one if you sell it (or your ex-REALLY good friend wrecks it 😡). As ALWAYS, Super-Great stuff, LT! Can your next blog be about convincing your spouse that you need two bikes? Asking for a friend. Ride on, and Write on, because you’re Right on!!! Sorry to hear about your CBR, that’s such a bummer! Loaning bikes to friends is a difficult proposition; best case scenario you guys get to ride together, worst case you end up losing something dear to you. Sorry you lost a bike and a friendship out of that one. Your advice to newbies is excellent! I agree, try as many bikes as you can before choosing. The only way you can know if a bike feels right is to feel it out! Dealer is probably the best choice, they have the insurance for that 😉 And pictures, yes. I wish I had taken more of The Rat pre-rebuild! Thanks for your blog….just read a few postings and am looking forward to more….I myself just bought my first bike…..I didn’t want to buy a smaller bike to only quickly outgrow it and not be able to get the next best bigger etc….I am Simi regreting my purchase as I went “all in” and picked up an Electra Glide Limited….. however I love this bike and will just have to take things a little slower and have patience with myself….also going to take a rider course that uses 125/250 size bikes… THANKS AGAIN! Hey Mike, thanks so much! Sounds like you have the right attitude, I hope your learning process goes well! Just keep at it and take it at your own speed, you’ll be ripping around on the Electra before you know it 🙂 Ride safe!